‘I am Cynthia M. Brown, a former child soldier. While barely surviving as a refugee at Buduburam camp in Ghana, I had great fear that I would never be accepted again in my home country of Liberia. I thought that reintegration would be a nightmare for me considering all the atrocities committed during the civil war in Liberia. I met the Chief Executive of the Africa Trust at Buduburam and again in Liberia and after working hard and showing my potential during training, I was given my present job. Working on Africa Trust funded projects has changed me from living a ghetto life as a drug addict and hopeless person, child prostitute and alcoholic to a responsible life changer, passionate aid worker and instrument of hope and change for poor people in Liberia. As Program Officer for logistics and procurement for the Liberia Trust, a local charity implementing projects for the Africa Trust in Liberia, I am responsible to draw up logistical plans, do purchases, deliver materials in the field and keep track of all the possessions of the organisation. I make regular monthly reports to the Country Manager. 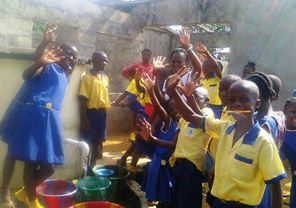 The Liberia Trust is building Elephant Pumps and Elephant Toilets for poor communities with funding from the Africa Trust. I help with construction of pumps and toilets as I am now a qualified builder. I also help with monitoring and evaluation, maintenance and facilitating maintenance workshops. 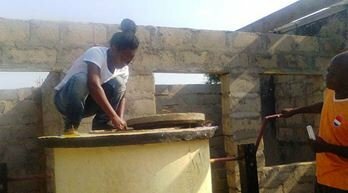 My passion is to help poor community dwellers improve their lives and it helps so much that a beneficiary family named their new born baby girl after me because, according to them, they wanted the child to be like me to grow in my life style. This was my greatest moment of pride, to become a role model instead of a useless person. Working on the Africa Trust funded projects earned me respect, integrity and trust. My physical and mental capacities have developed greatly as a result of my work. This helped me identify my potentials to change the lives of others.